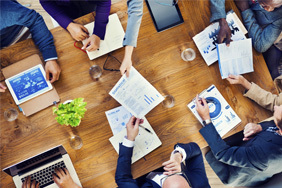 Learn about the latest additions to the Embarcadero developer tools family and get insights into how to build high quality, modern and sophisticated applications on August 19th. 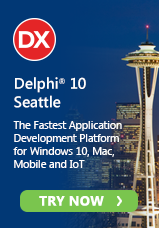 Learn how RAD Studio developers are ideally placed to take advantage of Windows 10 and why now is the time to prepare for new ways of developing and deploying Windows applications. 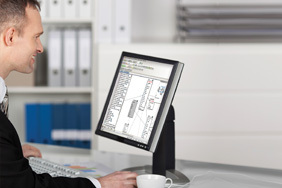 Join us for the newest RAD in Action series webinar on August 26 and learn how to build a complete application that runs on Windows desktops and mobile devices. 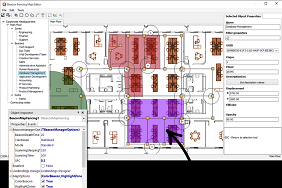 Add precision spatial location awareness to your applications both indoors and outdoors. Available free through the GetIt package manager in RAD Studio XE8. Ready to expand your coding skills? 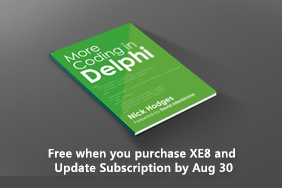 Get the new “More Coding in Delphi” eBook free when you buy or upgrade to RAD Studio, Delphi or C++Builder XE8 plus Update Subscription. Embarcadero has partnered with AerServ to provide developers with the first third-party video advertising component for use with RAD Studio. David I gives you all the details.